E: As promised, here’s a post about something to do with leftover risotto (and, I think, a good reason to make sure you always have leftover risotto). 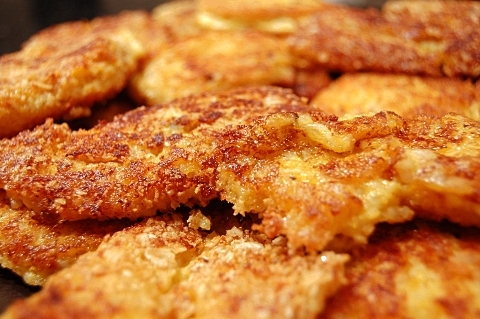 My introduction to risotto cakes came years ago, sadly before I even knew what risotto was. My family used to get them from the deli/to-go section of Whole Foods Market, and all I knew was they were fried balls of rice, cheese and zucchini. And they were awesome. Especially, oddly enough, with teriyaki sauce—really, try it. Despite making risotto many times, I’ve never attempted risotto cakes before. It is really easy, but let me walk you through and give some tips along the way. E: This dish was inspired both by the ravioli that we just posted and by the pear and ricotta stuffed chicken that went up in mid-May. We used the leftover ravioli filling to stuff some chicken, which came out really well, and so I decided to re-make it and post about it. I made this about a week later, so this is still a blast from the past—thankfully recipes, unlike food, don’t spoil. To go with it I made a risotto, which is pretty standard fare here on Nombudsman, and a really excellent quasi-Matignon which became so much the star of the dish, flavor-wise, that I decided it should have enough space to present itself to you, dear readers. J: Okay, so I make a lot of risotto. It’s become one of my “causes” to try and get more people to appreciate how versatile basic risotto can be, and how really simple it is to make once you’ve gotten the hang of it. Pretty much, if I’m at a dead loss for what to make for dinner and I have some arborio rice hanging out in my kitchen, you can bet a risotto is in the works. Most risottos that I make are, admittedly, not hugely full of nutrients. 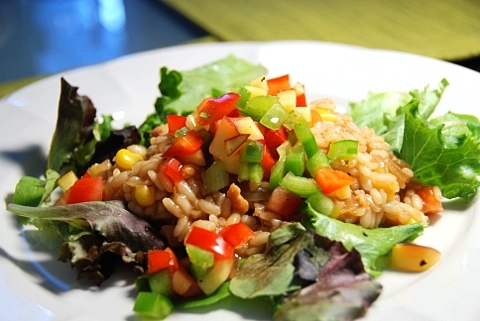 In fact, I think risotto in general is seen as being pretty unhealthy for you, because a lot of people make it with a ton of cheese, maybe butter, sometimes wine, and the other added ingredients can sometimes take a back seat to the creaminess of the rice itself, which really shouldn’t ever happen. 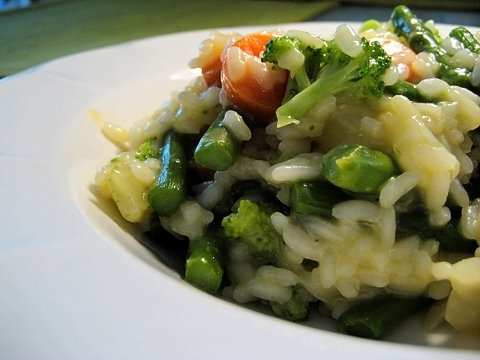 Arborio rice is a fantastic blank canvas, and you can (and should!) get creative with the kinds of things you throw in. Some really awesome flavor and texture combinations can come out of it. J: As I’ve mentioned before, a lot of people seem to be kind of scared of risotto for no good reason. It does require a bit of babying and attention, but it’s really not much more than stirring a pot of rice continuously for half an hour. Hard? Not so much. 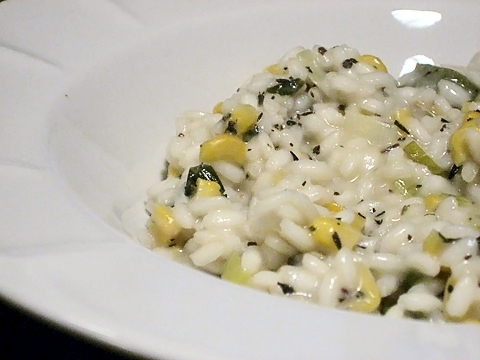 I’m also pretty much always up for trying new risotto recipes, and this one from Cat Cora (one of the Iron Chefs!) was awesome, with sweet corn and herbes de provence giving it a distinctive and fresh taste. Bizarrely, I could not find herbes de provence in my local grocery store, so I improvised with what I had on hand, using approximately 1 1/2 tsp thyme, 3/4ish tsp basil, and 3/4ish tsp rosemary instead. If you can find herbes de provence, I’d recommend using it, but if not, the risotto still tasted pretty yummy with my herb substitutions, so feel free to give that a shot. Risotto gets a bad rap. Not in terms of taste — I’m pretty sure everyone agrees that it’s absurdly delicious — but people seem to think it’s so difficult to make! It’s not hard at all. And it’s absolutely magical to watch the little grains of arborio rice soak up the broth and/or wine and turn into warm, creamy risotto. All it takes is a willingness to baby your risotto a little bit; it needs attention, that’s it. I wanted to make a risotto, but wasn’t sure what kind. 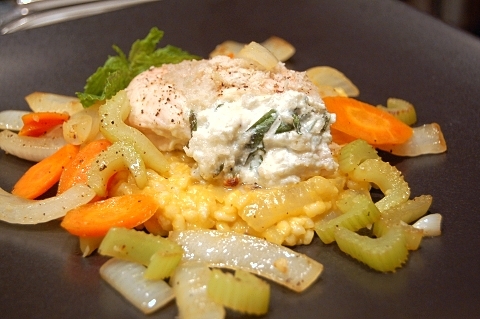 I found a recipe for zucchini risotto, and decided that that was a great idea in principle, but needed a little kick. Lemon juice gave it a great freshness, and I decided to take a chance and throw in some capers for a little salty bite. Capers are close enough to olives (which I positively hate) that I can’t love them, but far enough away that I can have them in moderation, and in this risotto they worked beautifully. So, enough suspense! On to the recipe. You are currently browsing entries tagged with risotto at Nombudsman.